Anatomy of a Super Salad, & a Rosh Hashanah Blog Party!!! When Miriam over at Overtime Cook contacted me about participating in a Rosh Hashana Blog Party, I was excited, but then I thought, “hmmmm, this seems like a food blog thing, and my blog isn’t really a food blog.” I mean, I don’t take pretty pictures of food, and I don’t do recipes. I just organize them. The First Ever Jewish Holiday Blog Party!!! As you may know, Rosh Hashanah, the Jewish New Year, is coming up, and Jewish bloggers from all over the world are celebrating with all kinds of twists on traditional Rosh Hashanah foods. 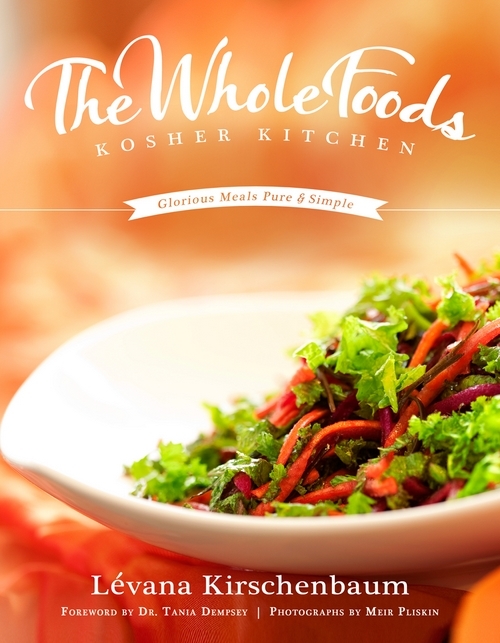 To kick off the celebration, Levana Kirschenbaum is giving away a copy of her fabulous new book, The Whole Foods Kosher Kitchen to three lucky winners. To enter, leave a comment about your favorite kind of apple on this post. Limit one entry per reader per blog so click over to the other participating blogs below for your chance at additional entries! Giveaway ends 5 am eastern time on September 11th, 2012. Prize is sponsored by Levana and available to readers from all blogs participating in the Rosh Hashanah Blog Party. Prize can only be shipped within the US. This is the first of hopefully many exciting Holiday Blog Parties, so if you wanna be part of the party, please email holidayblogparties@gmail.com. And now, for my recipe, the Super Salad. This salad, which can come in many forms, was mainly inspired by my dear friend Maya, who was making super salads back in our seminary days. She is an amazing cook and baker, and I am happy to be influenced by the little I remember about her delicious concoctions. Salad is one of those things which can elicit a groan, as in, “ugh, I’m on a diet and all I can eat is salad.” Maya’s salads never prompted any such sentiment. Ever. She has a real talent in making tantalizing and creatively delicious salads out of an otherwise boring dish. One thing I learned from her is that adding roasted garlic to a salad is a fantastic idea. I remember sitting in our dorm’s communal kitchen, watching her cut the top off the garlic, wrap it in foil and roast it in our precious toaster oven. When it was finished, I would watch as she squeezed the hot garlic onto her already awesome salad to make it even more awesome. 1. Lettuce. I know that not all salads require lettuce, but this one does. Some people like iceberg, but personally, I like the flavor of Romaine. Yes, it can be a pain to check it, so often I will buy it in a bag (because I live in Baltimore, where I can buy it with kosher certification. I know, it’s awesome. Sorry if you don’t have that option). 2. Veggies. These can be fresh, sauteed or roasted. Lately, I’ve been going with the roasted (even though it’s been a million degrees – it’s a little crazy, I know). I’ll roast some grape tomatoes with olive oil, and an eggplant, seasoned with olive oil, salt and pepper, and then add them to the salad. SO YUMMY. Zucchini and yellow squash are also yummy additions, as are sliced olives. And, of course, roasted garlic. 3. Sweetness. So, roasted tomatoes are kind of sweet, so that counts, but sometimes I also add Craisins, or raisins, or maybe some sliced up apples. Mandarin oranges seem to get used in salads a lot, but I’ve never jumped on that wagon. No reason, just haven’t done it. 4. Protein. This could be a sliced hard-boiled egg, cut up chicken (I like sauteed chicken, seasoned with olive oil, salt and pepper), tuna, tofu, or beans. Or a combination thereof. 5. Crunch. Croutons work, or sometimes I just crush some crackers and throw those in. Also nuts are good, and if I use honey-coated pecans I satisfy my need for both sweetness AND crunch. Win win! 6. Dressing. Most of the time I just use olive oil, a vinegar (lately I’ve been rocking the red-wine variety), salt, pepper, onion powder, garlic powder, maybe some ground mustard, and a little honey. Or I could go a different route and use sesame oil, rice vinegar and some soy sauce. Or I could make a Caeserish dressing with mayo, mustard, olive oil, salt, pepper and parsley. Whatever. I just don’t use dressing in a bottle. Shelly of The Kosher Home made Apple, Honey and Pomegranate Challah! So, go on now, have some fun at this fantastic Rosh Hashanah Blog Party! And have a wonderful new year, filled with many, many good and sweet things. Okay, first of all, Easy Breazy Five Minute Brisket? Whaaaat? OMG! I am going over there ASAP! But first, I shall answer your question. But first, I will tell you of some sadness. We live in Western, New York. Where the apples are usually plentiful. But this year because of the early cold snap — you remember before all that serious heat, the apples have been damaged. I suspect they are going to be spendy this year. That said, I personally love Empire apples for munching. Ahhh, fresh off the tree? There is nothing better. For cooking, I prefer a different apple, but you didn’t ask for my second favorite apple. And I totally want this cookbook! Going to check out some of the others. I have never thought about adding roasted garlic to a salad! I’m excited to try this. My favorite apples are Fujis! Thanks for participating!! Great post – love your Rosh Hashanah menu as well!! Your little ones are adorable! Thanks for the jumpstart on Rosh Hashanah menu planning – must get to that! Love this post. Although you may not be a recipe developer, you present a fantastic structure to use for working on salad recipes. Really useful for those of us who do develop recipes regularly! I love how you broke down the salad components instead of just giving a recipe. This way we can just choose what we like with your great ideas. My favorite apple is a cross between jazz (a little hard to find) and honeycrisp. Any apple baked into a crumble. Thank you for the party and the great recipe ideas! I’m very glad you decided to join the party, Rivki! I love how your present the salad. My favorite apples, hands down, are honeycrisp! My favorite apple is pink lady! Love roasted garlic with anything. My favorite apple is granny smith. LOL Maya. Rivki- love it! Thanks for giving me a use for my 4 eggplants that were destined to go bad for lack of inspiration. Pink lady apples = yes. Love this post and a great Rosh HaShana party/ Shana Tova!! honey crisps are my fav!! fantasic article,thank you! i adore honeycrisps!!! shana tova…are you ever coming back to st. louis to visit? shana tova! As a full time working mother of 5 any suggestions of easy recipes are greatly appreciated! Apple challah, I’m intrigued! I think my favorite apples are Winesaps. The local Whole Foods had them on sale for 99 cents a pound in season a year or two ago, and I must have bought about 20 pounds worth. So delicious. Mmmm. I wonder if they ever have Winesaps here; I haven’t seen them before.